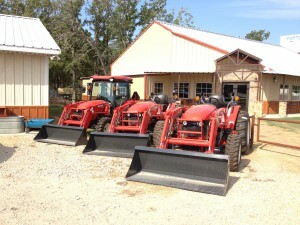 Eagle Hardware Farm & Ranch Supply officially sells Branson Tractors! Stop by soon and buy the tractor you’ve always wanted for your farm or ranch. Starting at $12,000, Branson has tractors ranging in horsepower from 24 to 55. The 00 series tractors are available in 4 models, two with manual transmission and two with hydrostatic transmission. Their 10 and 20 series tractors have 6 models, four with manual transmission and 2 available in hydrostatic. The 30 series tractors are available with or without air conditioned and heated cabs. The 40 series tractor is available in the cab model. Each model has a loader and backhoe available as well. We now carry a selection of tractor supplies. We have hydraulic oil, grade 5 and grade 8 bolts, grease, tractor pins, loft pins and PTO shafts. So, next time you are at Eagle don’t forget to pick up what you need for your tractor.